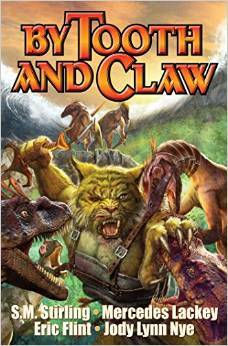 By Tooth and Claw: Clan of the Claw, Book 2 [edited by Bill Fawcett]. Riverdale, NY, Baen Books, April 2015, trade paperback $15.00 (309 pages), Kindle $8.99. Book 1, Exiled: Clan of the Claw, was published in August 2011. I had begun to think that Book 2 would never come out. Bill Fawcett has been editing, or packaging, books about the anthropomorphic feline Mrem fighting the anthropomorphic reptilian Liskash/Lizcanth for over twenty-five years. In 1989/90 he got four paperback novels by different authors published in Bantam Spectra’s Guardians of the Three series. Only one was any good, but that one, Keeper of the City by Peter Morwood & Diane Duane, is one of the finest anthropomorphic adventures ever written, well worth seeking out today. Fawcett’s second series, the 1999 three Shattered Light paperbacks for Pocket Books, was notable for only Catseye by William R. Forschen & Jaki Demarest, a cheerful ripoff of Dumas’ The Three Musketeers with a human teenage swordsman trying to join three Mrem King’s musketeers fighting a Lizcanth Cardinal’s Guard. The Clan of the Claw series for Baen Books supposes that the giant meteor that crashed into the Earth 65.5 million years ago, causing the extinction of the dinosaurs (according to many paleontologists), never occurred. (This is the same premise as Pixar’s forthcoming The Good Dinosaur.) The dinosaurs continued to evolve and became the reptilian manlike Liskash. The new mammals also evolved and gave rise to the manlike felinoid Mrem. The two are deadly enemies. Both are about of Bronze Age technology, and possess “magic” that may really be psionic powers. The series takes place about 5.3 million years ago, when the Atlantic Ocean has just broken into and drowned the dry Mediterranean basin. The Clan of the Claw outline postulates that several clans of Mrem were living in the Mediterranean valley at the time. Most of those who did not drown scrambled up to the north to join the other Mrem clans in what is Europe today. One clan, the Clan of the Claw, went south and found itself in what is today North Africa, surrounded by hostile Liskash clans. The Mrem must battle their way around the new Mediterranean Sea to reach the other Mrem in Europe, endlessly defeating one Liskash clan after another. Frankly, Exiled: Clan of the Claw was barely worth reading. Presumably it was the authors’ ideas – Harry Turtledove’s in particular — to give their Mrem warriors names overly close to those in T. S. Eliot’s Old Possum’s Book of Practical Cats (Rantan Taggah instead of Rum Tum Tugger); and dash about in war chariots pulled by “krelprep” that seem unimaginatively like the Macedonians fighting the Persians in 333 B.C. They seemed to be more interested in stuffing in ingroup references and having fun than in telling a good adventure. However, I do blame Fawcett for all the smeerps, and the overall tone. William Athling Jr. (James Blish) complained in a 1955 review about lazy s-f authors who “call a rabbit a smeerp”. “As usual, the problem is ‘solved’ by pulling three rabbits out of the author’s hat (though of course he doesn’t call them rabbits – they look like rabbits, but if you call them smeerps, that makes it science fiction).” All four novellas in Exiled: Clan of the Claw had smeerps hopping about, so Fawcett must have suggested in his guidelines that the authors just call their rabbits smeerps, their horses krelpreps, their oxen bundors, etc., and they’d have exotic alien animals with no work. 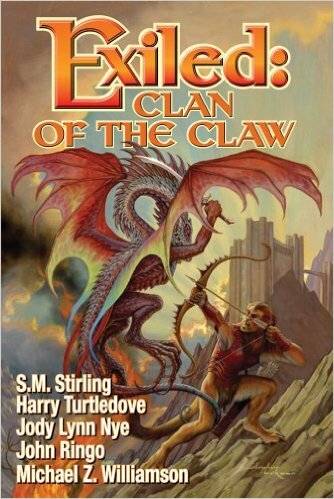 In Exiled: Clan of the Claw, the four novellas were by Harry Turtledove, S. M. Stirling, Michael Z. Williamson, and Jody Lynn Nye & John Ringo, all experienced s-f writers. Stirling and Nye (who is Fawcett’s wife, although she is a well-established s-f writer on her own) return in this Book 2, with three more writers. “By the time one of the roving groups of Liskash had found them, the clan had managed to survive two full moons, always in retreat from the waters, never quite sure what they were fleeing to. But a few stragglers from other clans had come through, with a rumor. The Clan of the Claw, always a strong clan, had survived the flooding intact. And they were gathering together any that would come to their banner. They were far to the south, however, across uncertain lands; it would be a perilous journey for the Clan of the Long Fang , even if they were fully equipped. “Bury My Heart” is a good beginning to the series. It describes dramatically what it must have been like when the Atlantic burst over the Straits of Hercules and began pouring into the dry Mediterranean basin. (Assuming that there was any genuine sentient life to see it. 5.3 million years ago was considerably before the evolution of humanity.) The novella is one battle after another against clans of Liskash. In “A Clan’s Foundation” by S. M. Stirling, the Flood and the chaos that it causes give the Mrem slaves of Liskash Lord Ashala’s clan the opportunity to escape. The Liskash kept the Mrem slaves separated to keep them weaker and used them for sport. Krar, the leader of the Mrem escapees, has to encourage them to unite and find the Clan of the Claw. By the time they do, they are effectively a new clan of their own. In “Sanctuary” by Eric Flint, a battle with powerful Liskash Lord Zilikazi’s army is disastrous for the Mrem. Only a few escape; two Dancers, five warriors, a warrior-in-training, four other females, and three kits. Dancer Achia Pazik takes command and leads them into the unknown mountains, with Zilikazi (a self-proclaimed god) and his Liskash troops after them. In “Feeding a Fever” by Jody Lynn Nye, all of the black-furred Lailah Clan including their female religious Dancers fall victim to a plague that weakens their magic (or psionic powers) just when the Clan is forced to retreat into unknown Liskash lands. Fortunately, the Liskash are also victim to the plague. Petru, a valet to the Dancers, is one of the few to escape the plague. He must assume the leadership in all the Lailah’s groups, and try to hasten their curing before the Liskash are well enough to attack. “Unlike some other clans, who boasted members of wildly different coat colors and length, Long Fangers were fairly uniform in color and appearance; dense, sandy-gray fur, shading to cream on the face and underbelly. And they had two very distinct characteristics; tuft-tipped ears, and naturally bobbed tails, both very useful in woodlands.” (p. 7) But the Mrem in “A Clan’s Foundation” have long tails. Still, for all of their feline and reptilian attributes, the Mrem and Liskash are too much like characters from any Bronze Age historical novel. Presumably there will be a Book 3 around 2018 or 2019. Most of us can stand the wait. Baen Books published that?! Oh my god! After hearing Paul Kidd say that mainstream publishers don’t want to publish “furry stories” which I believed meant “stories with all anthropomorphic animal characters,” I believed that not even Baen would. But that was said over six years ago and this book was published just last year.